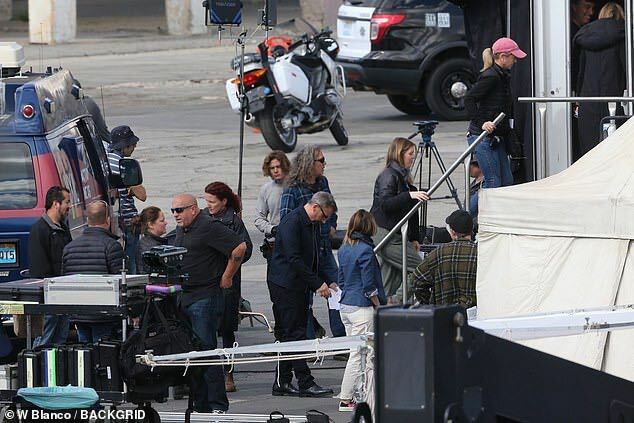 Jennifer Aniston co-authors and stars in Apple’s upcoming drama series revolving around the lives of TV personalities and their unique challenges, and now first images from the set on the downtown Los Angeles have leaked ahead of Apple’s video-streaming reveal at the star-studded “It’s Showtime” event next Monday. Carrell wore glasses and a black collared jacket with matching pants selected by costume supervisor Tom Macdonald. Anniston, 50, was photographed on the set wearing a black turtleneck, matching flared pants and heels selected for her role by costumer Anne Laoparadonchai. In between takes, Jennifer bundled up in a black sleeveless puffer maxi-coat as she clutched her iPhone and script pages. Aniston’s usual hairstylist Chris McMillan coiffed her signature flaxen waves for the shoot. In between takes, Jennifer bundled up in a black sleeveless puffer maxi-coat as she clutched her iPhone and script pages. The ‘Dumplin’ actress and the 56-year-old ‘Office’ alum were both filming scenes beside a van marked KXIL 12 Action News. According to Variety, the series offers a behind-the-scenes look at a Manhattan morning show and the unique challenges of its TV personalities that air each morning. The show is based on the CNN correspondent Brian Stelter’s “Top of the Morning” book. The project is also a rekindling between Aniston and Witherspoon, who got cast as Aniston’s younger sister on “Friends” (Aniston’s last starring role in a TV show).